On a recent trip to the States, I had the distinct enjoyment of catching a show at the Grand Ole Opry. Nestled in the excitement of performances by Dierks Bentley, Ricky Skaggs and popular duo Steel Magnolia, was Texas femme fatal Sunny Sweeney. The powerhouse performer, someone I had never heard of, delivered a confident set, one that had the capacity crowd enthralled, entertained, and enamoured. Count me in as one of the faithful. The popular Lone Star State singer and songwriter, a lady who alternates her Haggard T-shirts with legendary pride, she has a collection of 41, is keenly focussed on her career, and, as equally, her music. 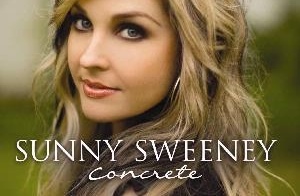 Simply put, her latest album, Concrete, is a persuasive mix of country, peppered with a rock tinge, all pulled together with a voice made for a Saturday night jump joint: someplace with a sawdust floor. Armed with a steady mix of 10 songs, and a band primed and pumped, the album earns four stars from me. Fans have an advantage over your humble correspondent – they know the music. However, given the worn grooves on my copy, I am quickly starting to appreciate the obvious talent. On this release, her second outing (Heartbreaker’s Hall of Fame, her first) Sweeney has not only snared industry interest, but has nabbed fans. Concert favorites like the emotional observation “From “A Table Away,” the honesty of a bad love gone on “Staying’s Worse Than Leaving” and the tailored for revenge “Drink Myself Single” are all enjoying radio spins. The popularity comes well endorsed, too. Sweeney recently had a 14-page spread dedicated to her in Lone Star Music -- a publication renowned for signposting Texas talent that shows wide promise. In the article, Sweeney didn’t hold back on stating it takes more than killer looks and crafted tunes to win the audience and build the fan base. The good news is Sweeny can. With tunes like “Amy,” the revealing “The Old Me,” “Worn Out Heart” and the tell-all “It Wrecks Me”, Sweeny is convincing, tuneful and gifted as a songwriter. Watch and wait. Sweeny is rock solid. Just like Concrete. The album, produced by Brett Beavers, is out now on Republic Nashville Records.